Good news for all Android Lollipop-ers! Google appears to be secretly working on a Virtual Private Network (VPN) service, dubbed 'Google VPN'. The news is still not confirmed, but the folks at Pocketables discovered an interesting hidden app called "Google Connectivity Services" under "All Apps" in the app manager, while digging through settings and apps after installing the latest version, Android 5.1 Lollipop on a Nexus 6 phone. After clicking on the created shortcut, the app greeted with a pop-up message that reads, "Google VPN: To help protect you on open Wi-Fi networks, your data will be transmitted securely through a Google VPN." The pop-up also has the "learn more" and "got it" options. However, since Google VPN feature is currently not in a functional state, you get redirected to a support page from Google if you click on "learn more" option. But if you click on the "got it" option, you are taken to the regular VPN connection request window, where you are asked if you would like the Wi-Fi assistant to set-up a VPN connection "that allows it to monitor network traffic." A virtual private network (VPN) basically allows people to connect to an unsecured WiFi network securely, which means the data transmitted through the network is fully secured. It uses encryption and other security protocols to encrypt users' data so that in case of man-in-the-middle (MitM) attacks, the intercepted data would be of no use for the intruders. Unfortunately, Google VPN feature doesn't actually do anything right now, though, as Google hasn't launched the service officially yet, which is why the Google VPN feature is not readily available for anyone to use. "Unfortunately, I wasn’t able to actually connect to any VPN, using an open WiFi network, a secured WiFi network, or LTE," reads Pocketables blog post. "It’s unclear when Google will launch this feature, whether it will be open to everyone or just certain types of users, or if Google might discontinue it, like it did with App Opps." 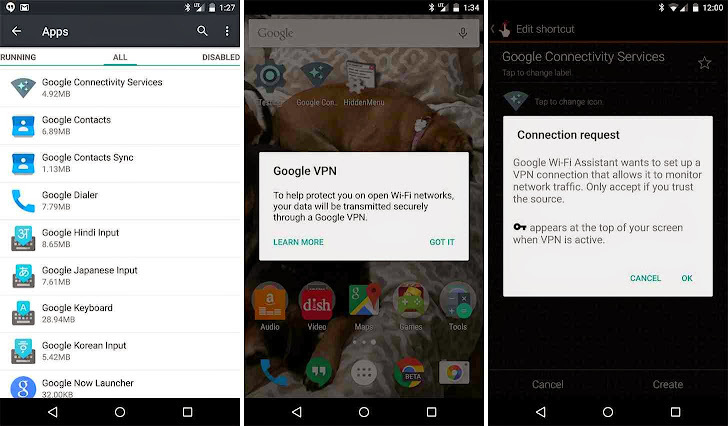 Google VPN is discovered on a Nexus 6 device, supposedly the only device that received Lollipop at first. So it's possible that the search engine giant is waiting for its VPN service to roll out first on Nexus 6 handsets.